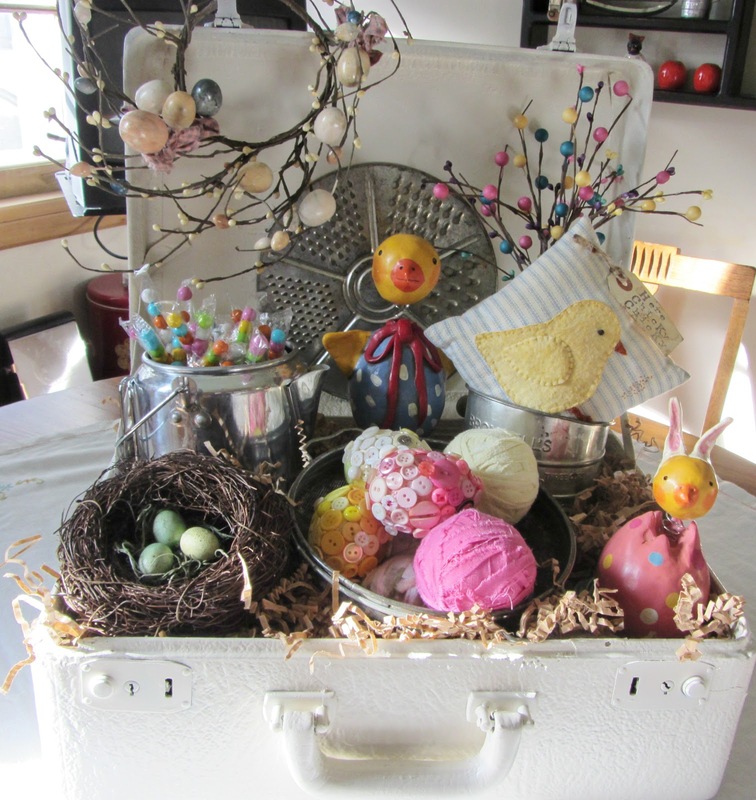 My creamy white vintage suitcase becomes an Easter vignette. The "bones" of my vignette, an aluminum flour sifter, coffeepot, measuring cups and a strainer/collander. A Penny McAllister chick disguised as a bunny perched in the measuring cups. My button jar Easter eggs and rag balls in a collander/strainer. 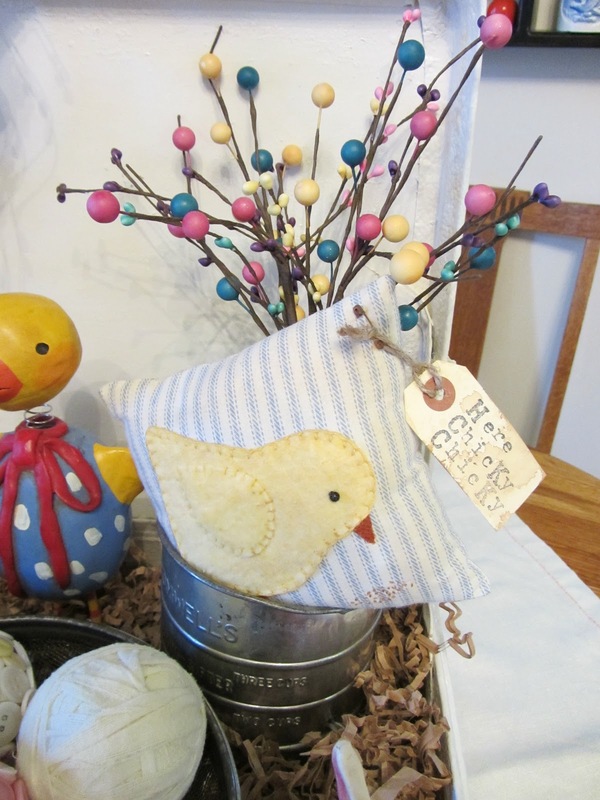 A chick ticking pillow in a vintage flour sifter. A Penny McAllister bobble head chick. 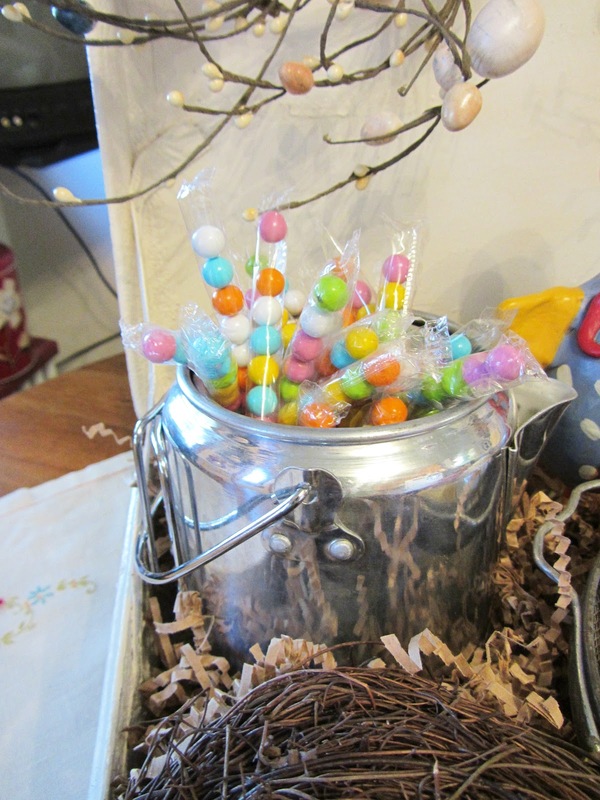 A vintage coffee pot with Easter Sixlets bouquet. 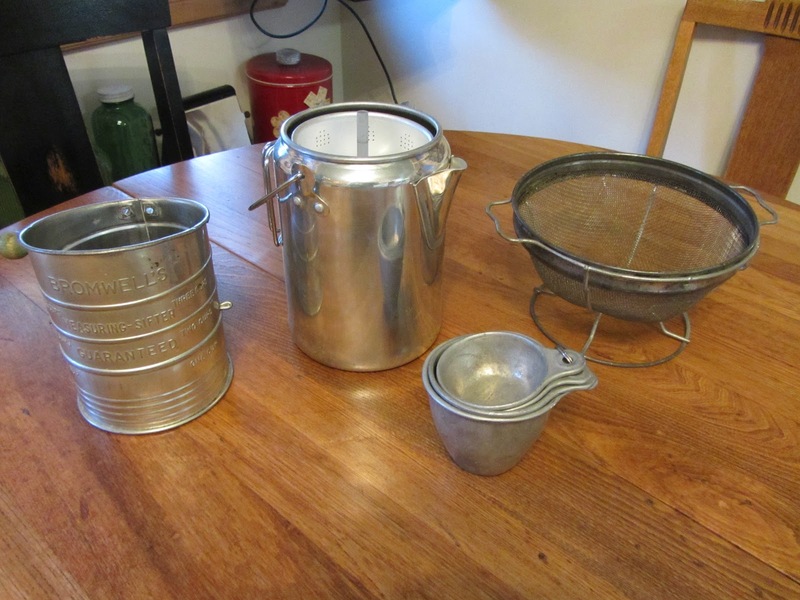 An old round aluminum grater is tucked in back. Oh, my gosh! I think you are incredibly creative to use that suitcase to hold your vignette. 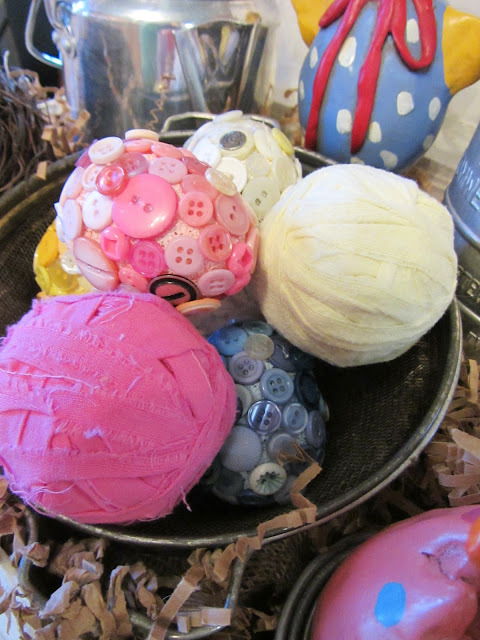 I love how you used vintage items as holders, and your button eggs are the cutest things! I see the eggs you made! Cute vignette and I like the little chicks..ducks?? I am not familiar with those! Have a great weekend! HI Carlene, this is so adorable. 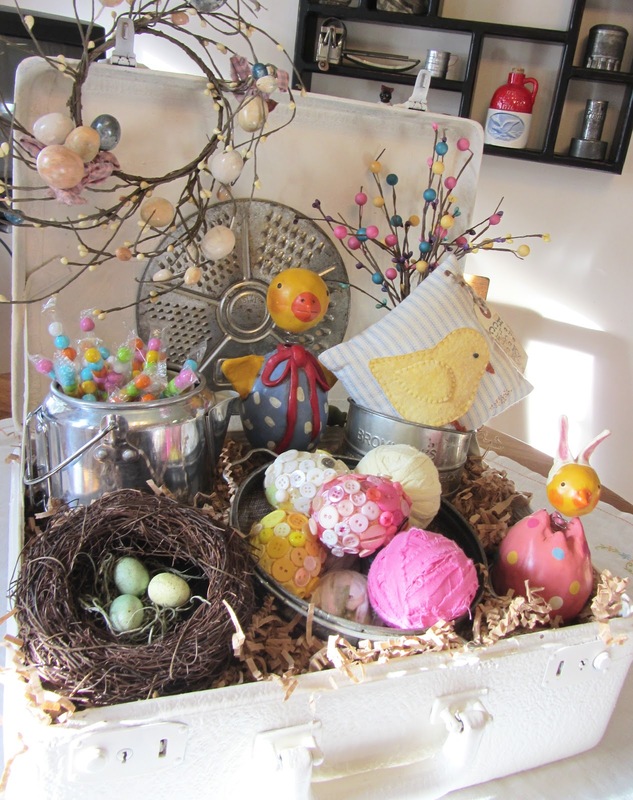 Love all the goodies you collected and the work of art you created for Easter. It is just so wonderful. Great creativity inside you girl! Hi Carlene, so happy you joined me today. Did my blog come up on your roll or did you have to add it? You have some great stuff here, I love it.That has to be the cutest little vignette ever. 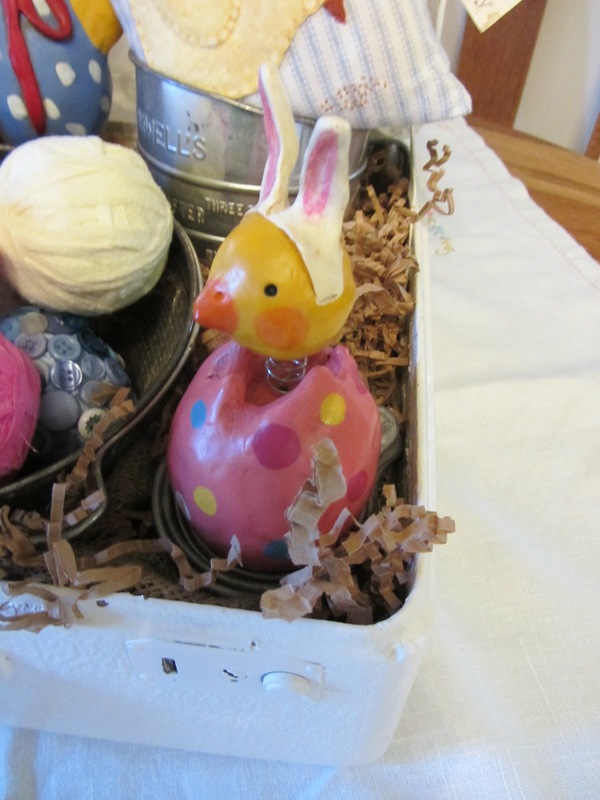 What an adorable Easter vignette! I see lots of ideas that inspire me in this one. Gotta admit, though, that the sixlets candies wouldn't last long around my house - after all, they are chocolate! Love your vignette. Did you paint the suitcase?? I love the look. If so, what kind of paint did you use. THANKS. 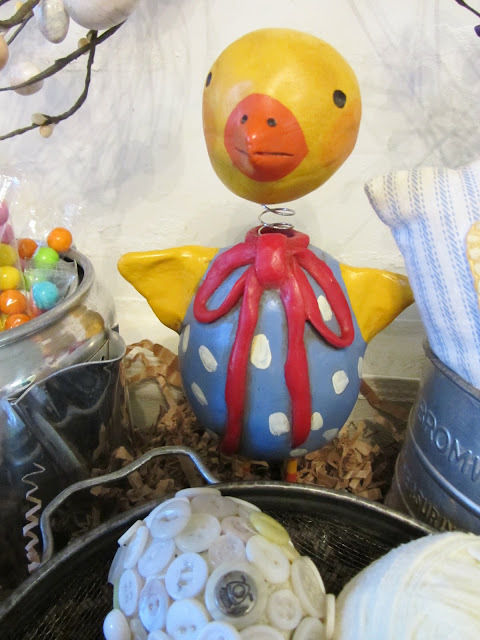 Come visit me at PICKINandPAINTIN.blogspot.com. OH SO DARLING! SO creative to use a suitcase!! I have had all my Easter and Spring stuff pulled out and sitting in front of my fireplace for 3 weeks now, you have motivated me to get started on it since we have similar tastes. Off to poke around and see what other cute things you have been up to. Hiya, Carlene! This is just adorable! 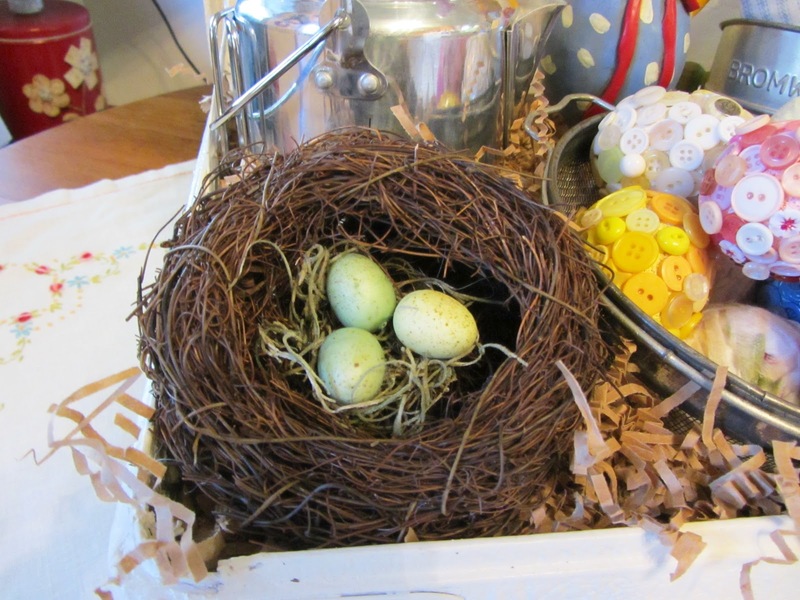 I love all the details you put into such a fun vignette! What a great idea! Love all the colors. I like the sixlet in the coffee cup!! So cute! I love it! It is so pretty! The details are just beautiful! Very, very cute! Cheerful and springy. Your are one great crafter Carlene. I am so envious. How lovely ideas for Easter. 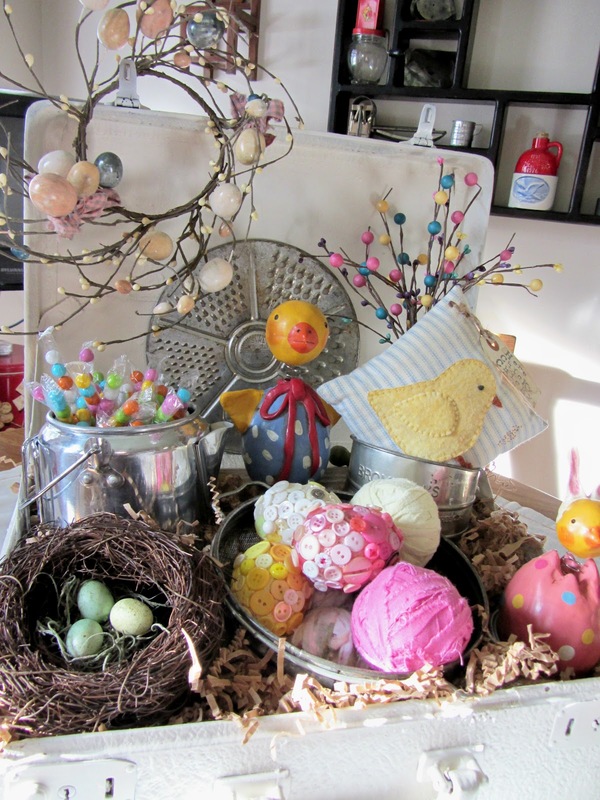 Visting from Debbiedoo's ~ What a darling vignette! How very cute! 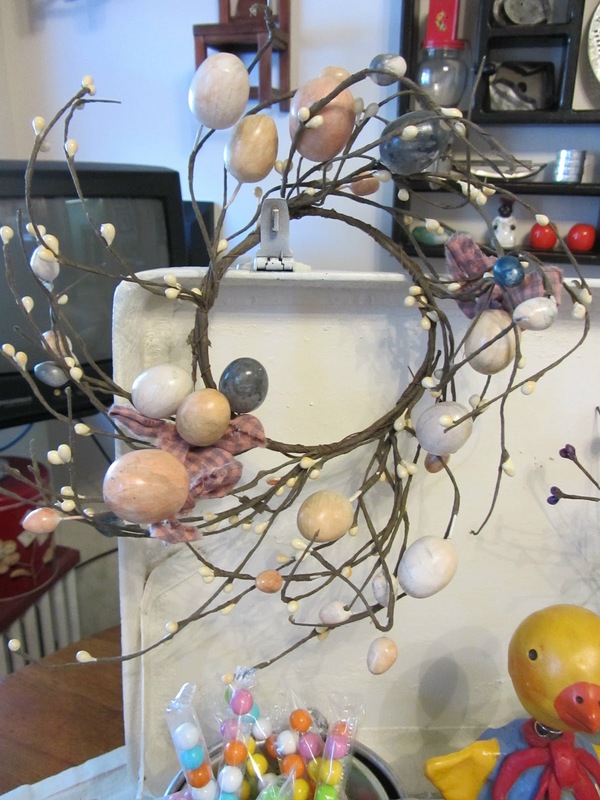 Love the little nest, how creative! So darn cute. I never would of thought of this. 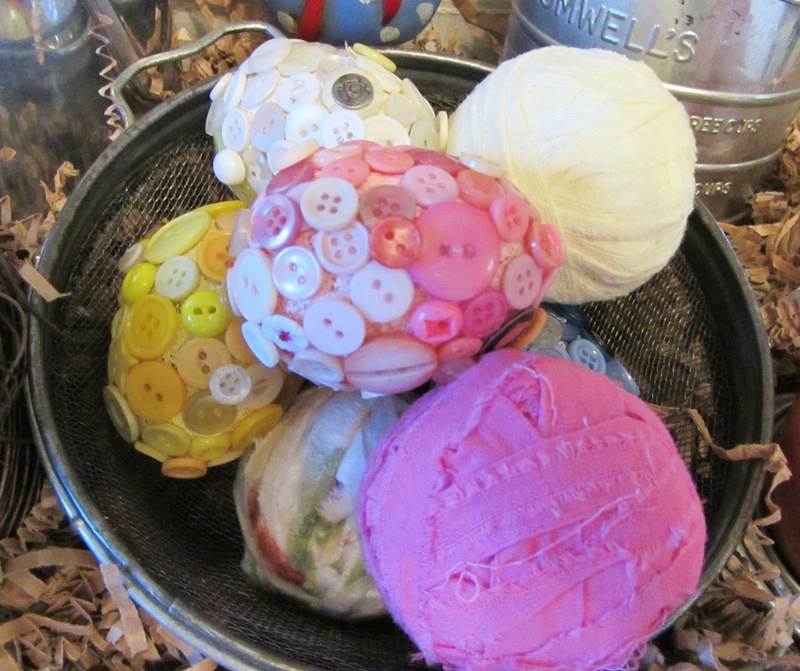 Love the button eggs, and your fillers. Very creative, cheery and springy. It would make me smile every time I walked by. So wanting that Chicky pillow, adorable. Thanks for sharing your creative inspiration at Sunday's Best. Oh my goodness, I absolutely love this vignette! Very clever & it looks so great! This is so very pretty and fresh. The bobble head chick is adorable. You have a nice touch un outting things together. Visiting from Debbie Doos! Your project is amazingly creative! I love all the inspiration. I love all the fun spring colors and how there are so many fun things to see. My favorite is the little chick pillow. I appreciate you visiting my party each week to share all your wonderful vignettes with us. Adorable! I never thought of using that stuff for something like that- great inspiration! Visiting via Centsational Girl. Love all the pretty! Happy day, happy spring, happy happy everything! I am following you now! That is so cute and actually something I could maybe emulate as I have some of those items. I don't have the suitcase but I never thought of using a colander or a grater etc. And I am all for using what I have on hand because I'm on a budget too! You are so inspiring! I see lots of "gorgeous" blogs but they spent money to buy those things to decorate. To me it is more of a challenge and more creative to use what you have and maybe just add a few new items. Beautiful job! You are my newest BFF! LOL! 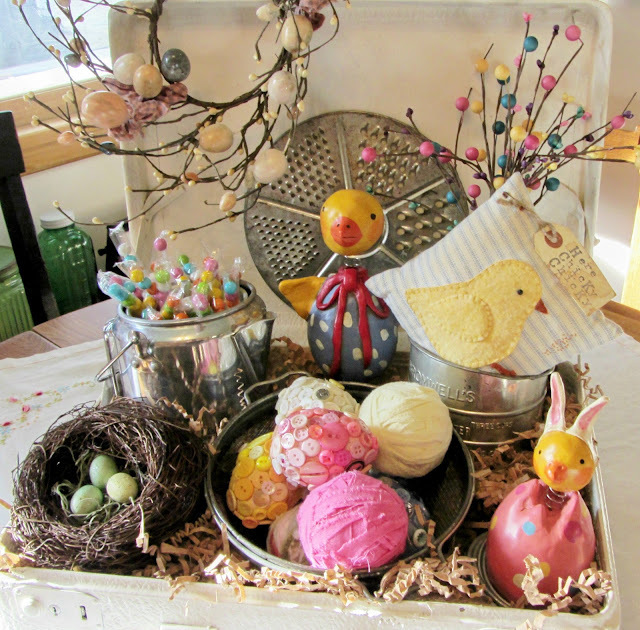 Happy Easter and Springtime!